The Big 5 ... record attendance. 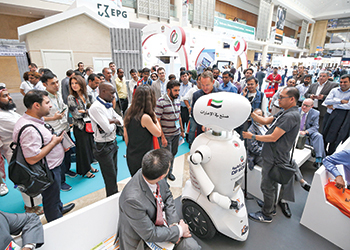 The 37th edition of the exhibition, held at the Dubai World Trade Centre, showcased the latest products and services of more than 3,100 exhibitors from 142 countries across the globe, making it bigger compared to last year. “With its record-breaking number of exhibitors and visitors attending the event, The Big 5 2016 was a great success, and the show will be even bigger and smarter next year,” stated Josine Heijmans, event director. dmg events also indicated that the largest construction exhibition in the Middle East will be back next year at the Dubai World Trade Centre from November 26 to 29, while the co-located Middle East Concrete (MEC) and PMV Live shows will run again in 2018 (March 26 to 28), as standalone events. Following this year’s success, the next edition of The Big 5 will further focus on the theme of ‘Technology in Construction’. Heijmans also said HVAC-R exhibitors will be clustered in a dedicated product sector in light of the heating, ventilation, air-conditioning and refrigeration industry’s strong development in the region. Moreover, The Big 5 2017 will go smart. Thanks to the introduction of the new Konduko smart technology, exhibitors will be able to send digital content to visitors, while capturing and qualifying leads from their smart phones. All visitors will be equipped with a smart badge that will interact with the exhibitors’ smart readers.